There were stressful exams, long nights studying and many fun times that led the Class of 2016 to graduation day. 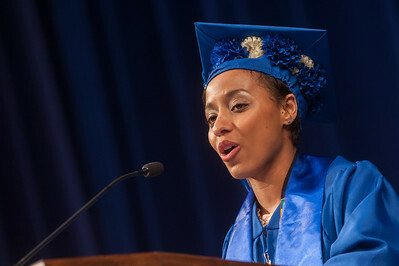 While they've spent the better part of four years focused on the future, senior commencement speaker Ishaiah Williams reminded the more than 2,000 students who were eligible to participate in Indiana State University's spring commencement ceremony to take a moment to look over the years that led up to that day. "We have all, in some way, overcome obstacles to make it to this specific spot on our journeys today, but what matters is that we are all here now. But this is not the end," said Williams, a health science major from Evansville. "If life were like a treasure map, this day would only be one of the red x's to mark the spots for treasure, but since we are sycamores, let's call them blue." "Treasure this moment and the many blue x's to come, whether they occur in your next educational journey, job searching, or even family milestones, just be sure to treasure each moment as they come because sometimes in life, we become so focused on the finish line that we forget to stop and smell the roses. We forget who held our hand to the next checkpoint, and we fail to find the joy in the journey itself." That journey took the efforts of many, from "motivated professors, supportive families, uplifting friends, inspiring community and everyone in between." "From our freshman year to where we are now, they've all been there preparing us for our next blue x, and as we all begin our next big adventure we will be well equipped with the necessities: leadership, morals, determination and so much more," Williams said. "There is no doubt in my mind that we all have a little superhero within us ready to save the world and if we all did everything we are capable of doing, we would literally astound ourselves." 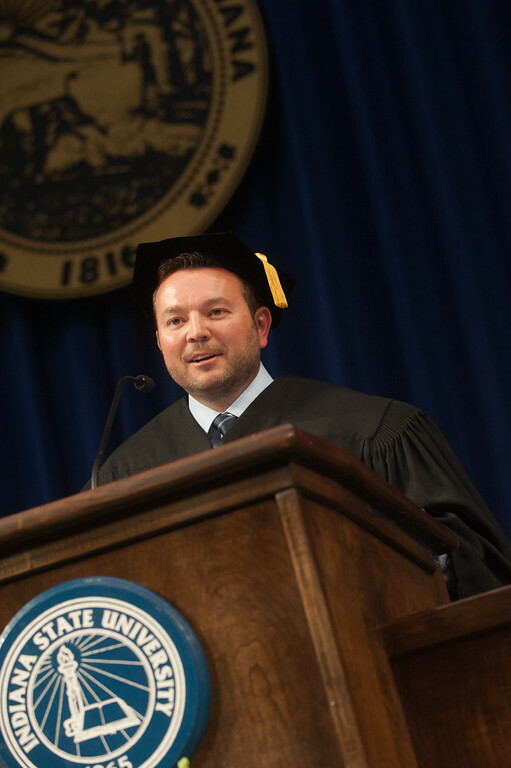 By not placing limits on themselves, the graduates could do more than they ever imagined, said Tim Leman, a 1997 Indiana State alumnus with a Bachelor of Science degree in insurance and risk management and chairman and CEO of Gibson Insurance who served as alumni speaker for commencement. It may not always be easy, but Indiana State has provided each graduate with the tools they need to succeed beyond college. "From alternative fall and spring breaks to course-based travel and studying abroad, our university sends us all over the world for unreal opportunities. You see at ISU, we have all created our own definition of success. So as we congregate here today to celebrate our hard work, we can reminisce on the amazing times we've had throughout our journey," said Mariah Wright, a construction management major from Clinton and student commencement speaker. It's a journey that the Class of 2016 fittingly began and ended in the same place. "Here we are again, gathered, but this time instead of marching through the arch to begin our journey as Sycamores, we are marching across the stage to shake President Bradley's hand and to become alumni of Indiana State University," Wright said. "The march through the arch symbolizes the transition from high school to college and now as we march across the stage, we experience the transition from college to the next chapter of our lives." 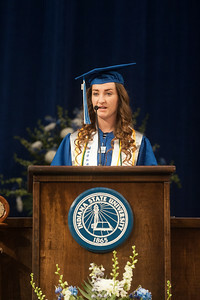 http://photos.indstate.edu/Events/Commencement/Commencement-2016/n-6s64m3/i-bQ69Gdg/0/S/i-bQ69Gdg-S.jpg - More than 2,000 students who were eligible to participate in Indiana State University's 2016 spring commencement ceremony at Hulman Center on Saturday, May 7.
http://photos.indstate.edu/Events/Commencement/Commencement-2016/n-6s64m3/i-rqPFhhn/0/S/i-rqPFhhn-S.jpg - Ishaiah Williams, a health science major from Evansville and the student speaker for the afternoon ceremony. More than 2,000 students who were eligible to participate in Indiana State University's 2016 spring commencement ceremony at Hulman Center on Saturday, May 7.
http://photos.indstate.edu/Events/Commencement/Commencement-2016/n-6s64m3/i-NBwPKx2/0/XL/i-NBwPKx2-XL.jpg - Tim Leman, a 1997 Indiana State alumnus with a Bachelor of Science degree in insurance and risk management and chairman and CEO of Gibson Insurance who served as alumni speaker for commencement. More than 2,000 students who were eligible to participate in Indiana State University's 2016 spring commencement ceremony at Hulman Center on Saturday, May 7.
http://photos.indstate.edu/Events/Commencement/Commencement-2016/n-6s64m3/i-8RJRh4s/0/S/i-8RJRh4s-S.jpg - Mariah Wright, a construction management major from Clinton and student commencement speaker for the morning ceremony. More than 2,000 students who were eligible to participate in Indiana State University's 2016 spring commencement ceremony at Hulman Center on Saturday, May 7. 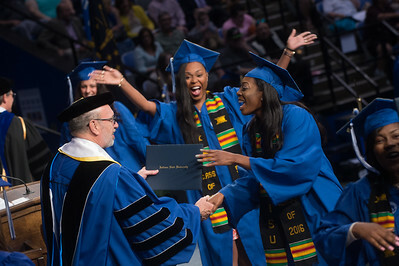 More than 2,000 students were eligible to participate in Indiana State University's spring commencement ceremony at Hulman Center on Saturday.